The day felt too long. The sun was bright in my eyes, the hours toward evening seemed to drag on for an eternity. As the evening breeze brought solace to the heat, the first of the fairies emerged. Their dance, the peacefully floating sparkles eased the anxiety of waiting. The lanterns were slowly lit, the scent of evening roses filled the air, the night began its approach in a slow, gentle embrace of shadows. It is time. Time for masks and mysteries, dances and delights. Time to forget the strength of sun and embrace the solace of night. It is time for the Masquerade Ball. The first ever May Day Masked Ball takes place this evening in Fantasy Faire. 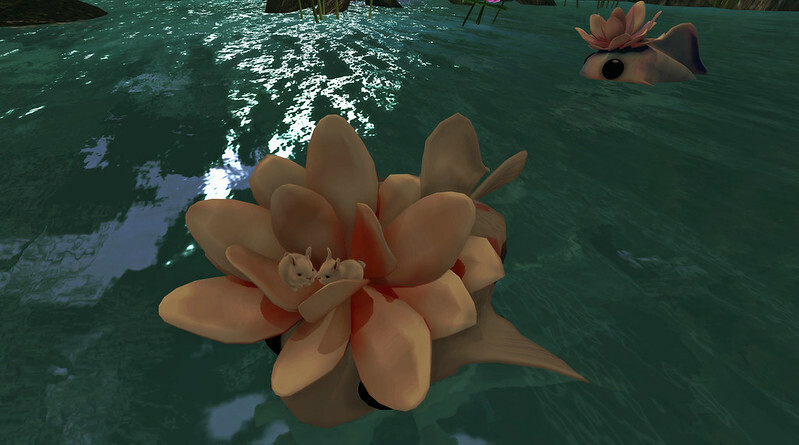 The Ball is 5-7pm SLT in Poseidon’s Abyss. 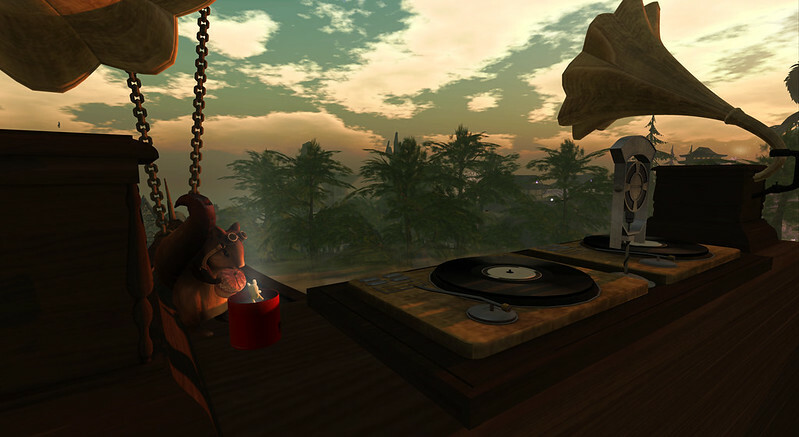 It is hosted by DJ Gabrielle Riel of Radio Riel and during the Ball there will also be an announcement of the King, Queen and Chancellor of Fantasy Faire. 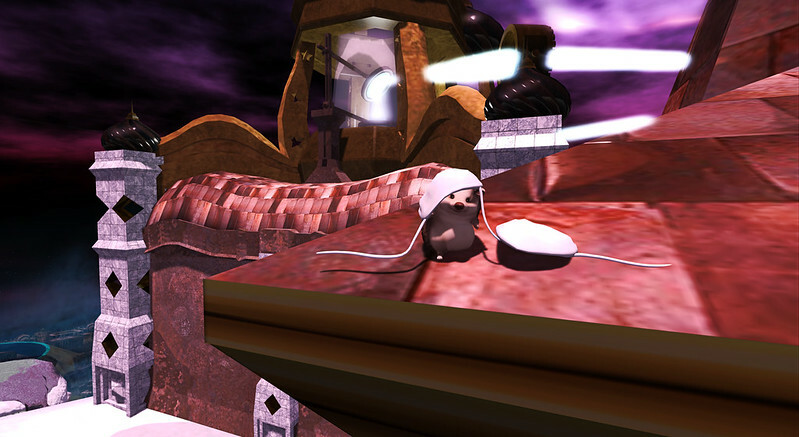 Both The White Armory and Bliensen + MaiTai can be found in the Spires of Andolys, Illusions has its Faire-store in Ichi-go Ichi-e. 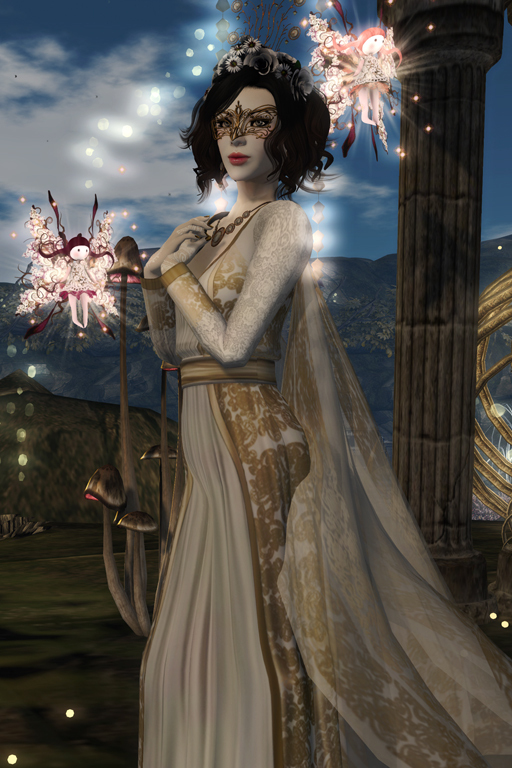 This post is befittingly about the Fantasy Faire Blogger Challenge: My New Shiny. Before this Faire I had never heard of LURE, Fallen Arms or Cole’s Corner, all of which are new shinies for me. I’m especially recommending catching the upcoming original music and particle show by ColeMarie Soleil, the creator of Cole’s Corner. The encore of her breathtakingly enchanting performance will take place in Ichi-go Ichi-e on Sunday, May 3rd at 12-2pm. 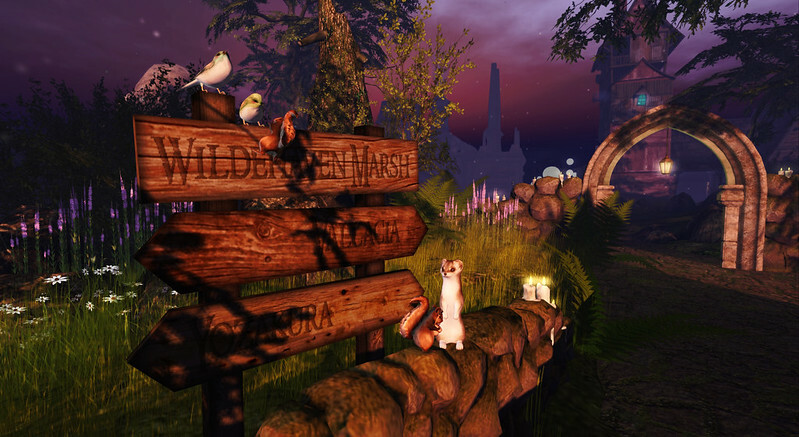 You can find Eclectica and Cole’s Corner in Ichi-go Ichi-e, Alegria Studio in Aurora, Spyralle and Wasabi Pills in Odyssey, *~*HopScotch*~* in Poppetsborough and LURE and Fallen Arms in Tangleshimmer Grove. Sometimes the sea is lit from above. The light slides lower within the waves like it had a will of its own, like it was stretching or reaching. Like it is calling. There’s sparkles there, dancing patterns, delightful in their motions, alluringly restless and alive. The calm steady embrace of the sea feels too quiet, the soft glow of the plants too subtle, even the rougher currents of the storms too steady. Sometimes when the light reaches down, I reach back. I glide higher, feeling it envelope me, taking my hand, pulling me higher. I can hear its whispers and all the warnings of my elders fade away. Up there — up here — everything is light! The colours, the strange water around me called air; so delicate, thin and light to move through. The colours overwhelm me, the dancing bright things floating higher… always higher. Just like I did, reaching for the surface despite warnings. I wonder, if I reached even higher, would my gliding reach another surface, break another barrier, bring me to yet another lighter place? How many surfaces are there? How many worlds can we find if we just keep on swimming up? Always, always up. It is the fifth day of Fantasy Faire, the first busy weekend is behind us and therefore this is now the perfect time to go shopping. Remember that you can window shop all the RFL vendors in here! 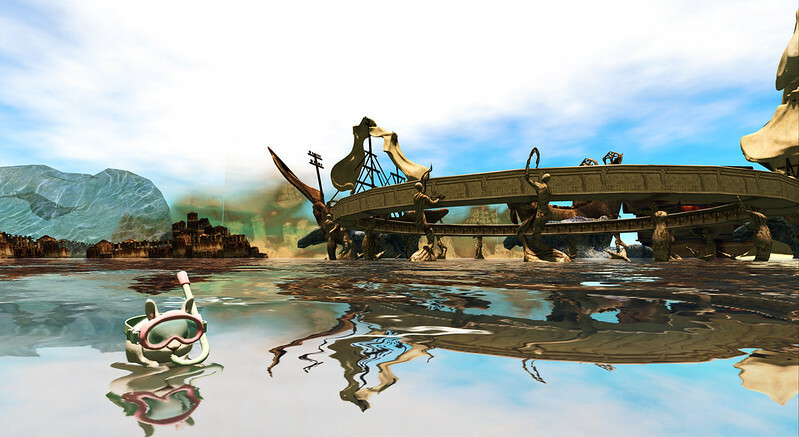 Fairelands Junction is mostly an underwater mer-realm this year. It is also sponsored by Cerridwen’s Cauldron, so its landscaping includes plenty of sea flora from the Cauldron. 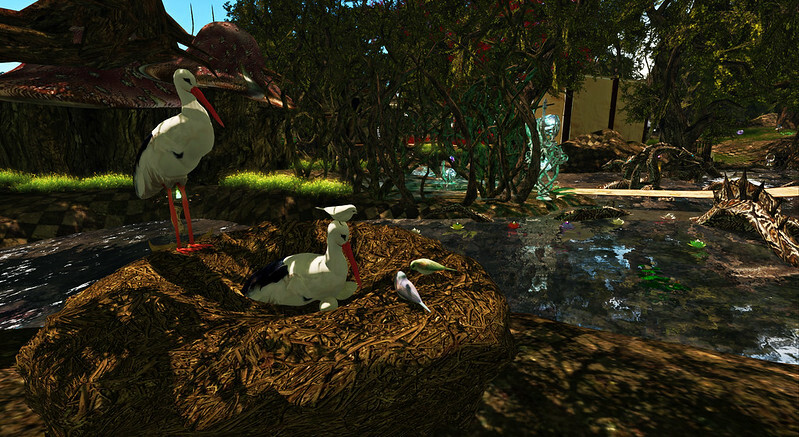 You can go shop for fantasy plants of your very own in Wildehaven Marsh. 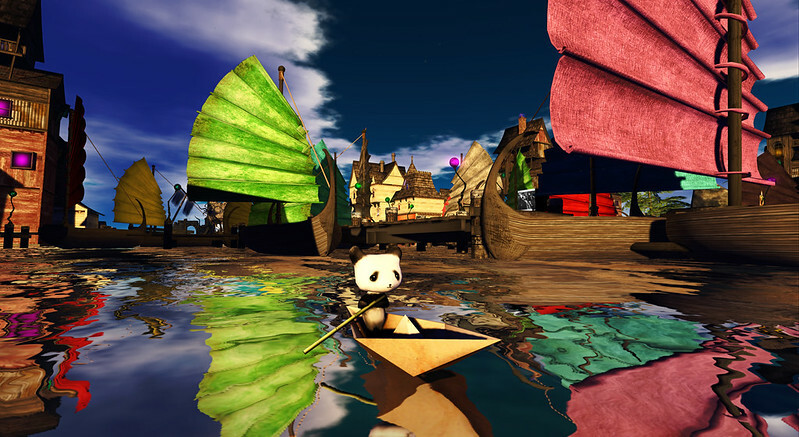 The little sea sprite is the latest petite avatar in the Faire-exclusives by Fallen Gods Inc. 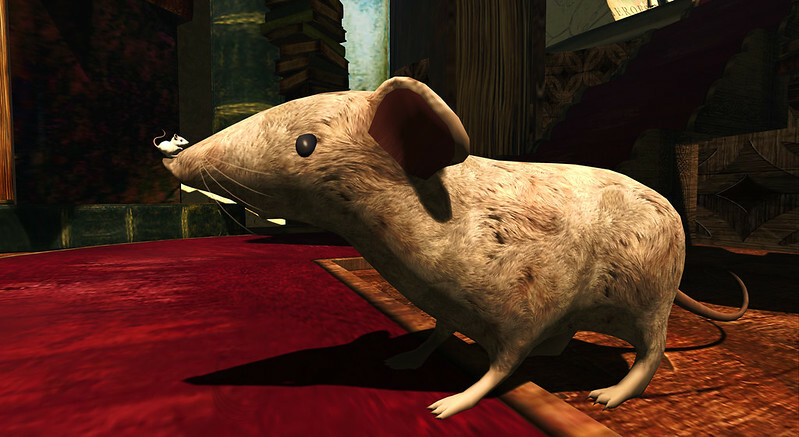 The older petite Faire-exclusives are also available for the duration of the Faire, all set in Odyssey. All the mer poses are by Yo Bailo and can be found in Wildehaven Marsh. They dance in the clear air, the daughters of frost. They glide with soft-flurried wings, as sharp as the biting cold. They glitter and sparkle like their smaller cousins, the sprites known as snowflakes. Their already freezing hair holds touches of the midwinter sun, the flowers they wear formed of snow and ice to adorn their twirling forms. Every graceful step freezes ground beneath them, every wing stroke breathes icy wind into the world, every twirl in the air sends out a breeze. They dance, the beauty of winter caught in a softly-flowing motion of a silhouette. They dance, and in their steps the frost flowers bloom. They dance, and the world holds its breath, frozen in silent bliss. Fantasy Faire has reached its first weekend and the Fairelands are bursting of activities. Read more here! 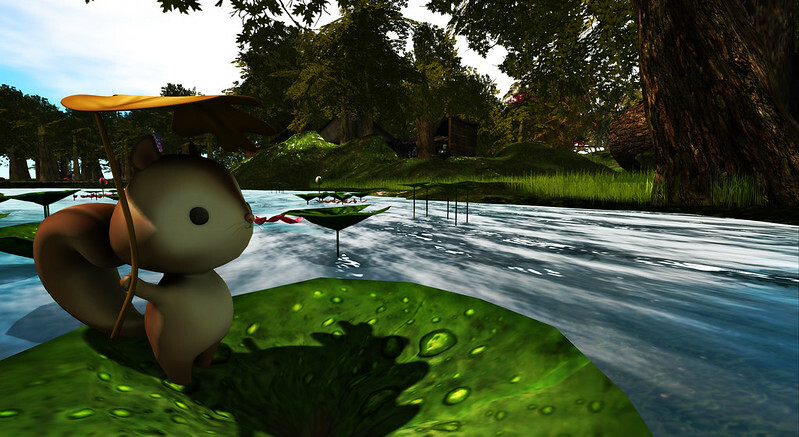 -AZUL- and [Gauze] can be found in YoZakura, Lumae, Eclectica and Cole’s Corner in Ichi-go Ichi-e, Wasabi Pills and Material Squirrel in Odyssey. The tattoo by Fallen Gods Inc. is a hunt prize in the Fairelands Hunt: The Lost Land. The transition was smoother this year. No lands were lost and the amount of magical energy required to form the Fairelands was at such high levels that the continent grew to the size never seen before. The Fairelands are awake now and like all living things, reaching toward the spring light, basking in it, full of life and promise. Full of magic and enchantment. All is prepared, the feasts have been set, the portals polished, the welcoming fairy dances practiced, the dragons pre-lectured about not eating any visitors. The Fairelands are here, the magic has arrived. You have eleven days to step through a portal and join the Faire Folk before the spells anchoring the Fairelands into reality fade once more. Eleven days to live in the fantasy world continent, eleven days to be all you want to be. Eleven days of enchantment. Fantasy Faire 2015 has just opened! You can begin your journey here in the Fairelands Junction, which has portals to all the other sims. This year there’s ten shopping sims and three additional ones: Fairelands Junction, Poseidon’s Abyss (Arts & Entertainment) and Ravenshold (The Lost Land Hunt). There’s Literary Festival, dance and particle shows, DJs, roleplay groups, May Day Ball, jail & bails, auctions… the eleven days are packed. Read more about it all in the Fantasy Faire website. You can find The Muses and Analog Dog Hair in Tangleshimmer Grove, [Gauze] in YoZakura, [MUSE] and Stitched in Spires of Andolys and .:Soul:. and Cole’s Corner in Ichi-go Ichi-e. The tattoo by Fallen Gods Inc. is a hunt prize in the Fairelands Hunt: The Lost Land.